The Sonata is one of those cars that actually grows on you – simple, rugged, solid and, nowadays, very, very cheap to buy and run. Because Hyundai went through a slightly odd period of transition, from ‘cheap and cheerless’ to 'really rather good’ and on to ‘totally competitive with anyone else’ it means that we have a tendency to forget some of its models. The old, hilariously awful ones we remember, and we know the generally excellent current range pretty well, but the cars that fell in the middle, the forgotten Hyundais, kind of exist in a nether world where they’re left out of the story, but deserve at least a footnote. The 2005 Sonata is one of those cars. 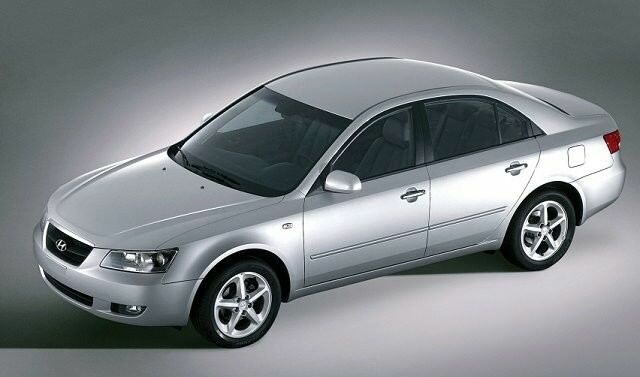 When you think of Hyundai Sonata, if you think of it at all, you tend to picture it as the 1998 to 2004 EF model, the one with the gawky looks that, once it was facelifted in 2001, looked rather like a Jaguar S-Type that had melted in the sun. All nasty cheap leather and fake plastic wood. The good news is that it’s better than that. Originally launched with a 2.4-litre petrol engine (which, unsurprisingly, was not a big seller), the range eventually expanded to include a 2.0-litre petrol, a 2.0-litre diesel and a Dodo-rare 3.3-litre V6 fuelled by petrol, which we can only assume was ever bought by Hyundai dealer principals with delusions of grandeur. Needless to say, the diesel is the one to go for. It’s noisy by modern diesel standards, but it should get a solid 45mpg in day-to-day driving. As a driving prospect, the Sonata was a massive improvement on previous models, but anyone who’s driven a modern Hyundai i40 won’t be impressed – the Sonata is soft, it rolls a lot, the steering is light and it’s basically no fun. Mind you, it’s also not bad either, as it's comfortable and easy-going. Undemanding is probably the word we’re looking for. Crammed is another good word. The Sonata was one of the last stuff-them-with-kit-and-sell-them-cheap Hyundais, so all have stability control, leather, air conditioning, alloys and a decent stereo. Later versions got climate control as standard, while some had cruise control and satnav. Reliability is also excellent. Hyundai was just getting into its stride with its five-year warranty at this time, so the Sonata stacks up well, and because it’s not too full of complex electronics, it’s a pretty solid choice. Check that it’s been serviced properly though – the temptation is to run a car like this on the cheap, and many will have been abused and seen rough use as taxis and the like. What you’re looking at here is a near-enough unbeatable metal-for-money ratio. You can pick up a pre-facelift petrol model for as little as €3,000, while even a well-equipped post-facelift car (which has a much nicer interior too) will set you back as little as €7k with a diesel engine. One to buy and run until it breaks – which will quite possibly be never. It may not look like the most exciting thing around but the Sonata is one of those cars that actually grows on you – simple, rugged, solid and, nowadays, very, very cheap to buy and run. Hard to think of a bad word to say about it, really.